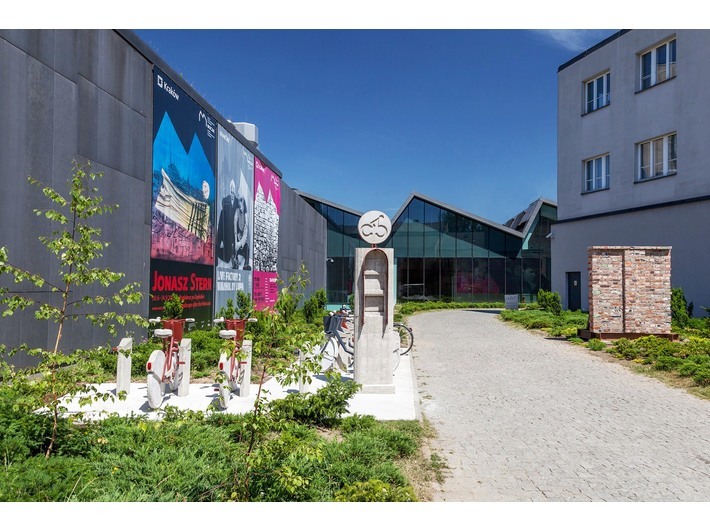 A group of artworks situated in the area surrounding MOCAK refers to four subjects: the Holocaust, history of art, history of politics and intervention in public space. The four works below will complement the MOCAK Collection permanent exhibition. Leopold Kessler is an artist who works in public space and whose interventions are usually some events, often filmed ones, or objects which take the form of permanent installations. One of these installations provisionally titled the dead café, can be seen in the 21er Haus museum foyer in Vienna. The object designed for the MOCAK collection belongs to the “in-utility convention”. It is a concrete model of a city bike station. From a distance it looks real but at a closer look it becomes obvious that what we see is a sculpture. This shock confirms our deeply-grounded conviction that all that surrounds us should be at our service. The year 2017 marks hundred years of one of the most famous artworks of all time, i.e. Marcel Duchamp’s Fountain. This object, classified as readymade, was an urinal placed on a footstall. Signed “R. Mutt” it was submitted for the exhibition of the Society of Independent Artists held at The Grand Central Palace in New York. Fountain was rejected by the members of the exhibition committee who did not recognize it as art and did not agree to exhibit the object. The original produced in 1917 was lost and in 1964 Duchamp authorised 17 replicas. Leszek Lewandowski decided to execute the artist’s will expressed in the title of the work and, specially for the Art in Art exhibition, designed a fountain which is exhibited at the gallery during summer months. This project has been inspired by the figure of Lech Wałęsa and his significance in the historic act of overthrowing communism. A Gift to Krakow from Gdańsk is a fragment of the Gdańsk Lenin Shipyard fence which Lech Wałęsa scaled on 14 August 1980 around 11 am (all the gates of the shipyard had been closed by that time) to join those who had gone on strike. When he arrived in the shipyard, he assumed the leadership of the Inter-factory Strike Committee. A list of twenty-one demands was issued by the Committee over which talks begun with the representatives of Poland’s communist government officials. The strike ended on 31 August 1980 when an accord was signed which later became known as one of the three August Agreements. This date is assumed as the symbolic beginning of the NSZZ Solidarity movement which led to the overthrow of communism in Poland and in Europe. A Gift to Krakow from Gdańsk was built out of bricks which were left after one of the shipyard halls was taken down. The artist was also inspired by a monument, a fragment of the shipyard wall, which stands close to the Solidarity headquarters in Gdańsk. The artist took nearly four hundred young birch trees from the area surrounding Auschwitz-Birkenau concentration camp where during World War II the ashes of those murdered there had been scattered. Over three hundred trees were taken to Berlin where, during the Berlin Biennale of Contemporary Art, they were planted in different locations, including parks, school gardens, cultural institutions and in memorial places connected with deportations and the Holocaust. The rest of the trees Surowiec planted in his garden or presented to friends. Three trees were included in the Poland – Israel – Germany: The Experience of Auschwitz exhibition and after it was closed, they were planted in front of the museum and thus became part of the MOCAK Collection. The trees are not only live monuments whose task is to remind people about the Holocaust but also the inheritors of its victims.